Returning for its 6th year, Festival No. 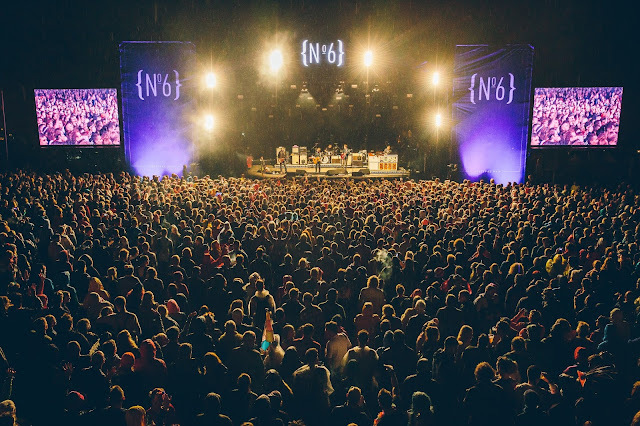 6 organisers have pulled out all the stops for what's set to be one of the festival's strongest line-up's to date. 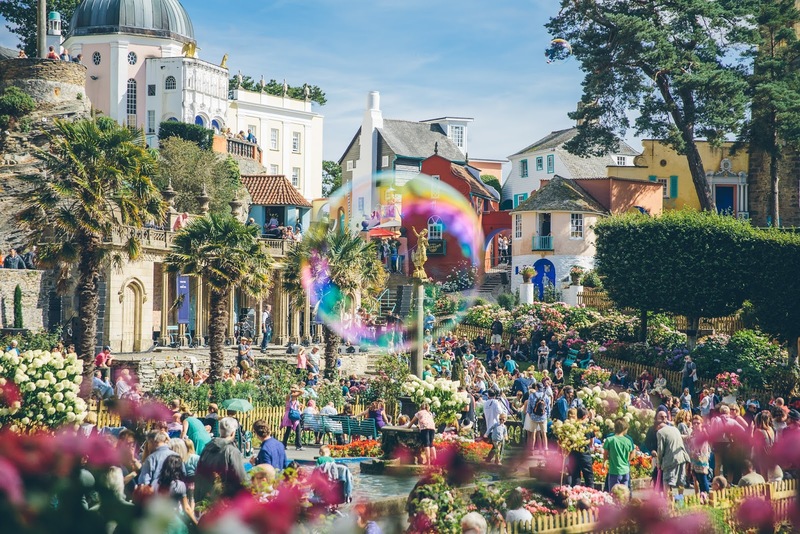 Descending to the picturesque village of Portmeirion on the Snowdonia coast, the behemoth arts, cultural and music festival will once more channel an ever diverse bill filled with a thrilling array of talent to give festival goers one final bash before the summer season's out. 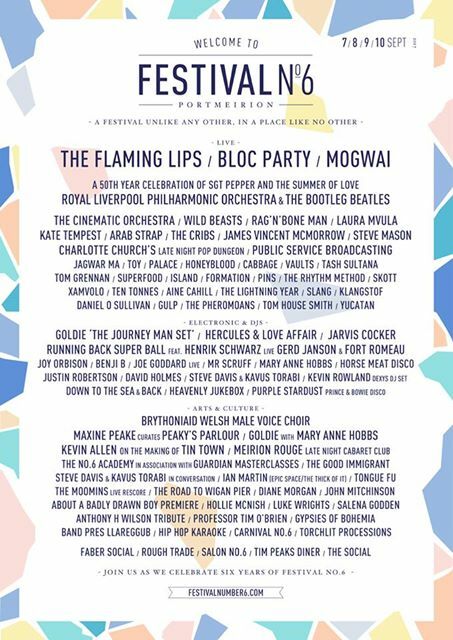 Joining the likes of The Flaming Lips, Mogwai and Bloc Party will be Royal Liverpool Philharmonic Orchestra and the Bootleg Beatles presenting a special 50th anniversary celebration of Sgt. Pepper’s and the Summer of Love (festival exclusive), The Cinematic Orchestra, Wild Beasts, Rag’n’Bone Man, Laura Mvula, Kate Tempest, Arab Strap, The Cribs, Public Service Broadcasting, James Vincent McMorrow, Charlotte Church’s Late Night Pop Dungeon, Jagwar Ma, Steve Mason, Toy, Palace, Honeyblood, Cabbage, Vaults, Tash Sultana, Tom Grennan, Superfood, Island, Formation, Pins, The Rhythm Method, Skott, Xamvolo, Ten Tonnes, Aine Cahill, The Lightening Year, Slang, Klangstof, Daniel O Sullivan, Gulp, The Pheromoans, Tom House Smith and Yucatan. There's also a whole host of DJ's and late night entertainment to mention from Goldie performing his new album The Journey Man through to nu-disco heroes Hercules and Love Affair. They'll be joined by Joy Orbison, Benji B, Joe Goddard Live, Mr Scruff, Mary Anne Hobbs, Horse Meat Disco, Justin Robertson, Jarvis Cocker, Running Back Super Ball: Henrik Schwarz (Live), Gerd Janson and Fort Romeau, David Holmes, Steve Davis & Kavus Torabi, Kevin Rowland (Dexys DJ Set), Down to the Sea and Back, Heavenly Jukebox and Purple Stardust - the ultimate Prince and Bowie disco. It doesn't stop there though. There's poetry, a full arts and culture programme, special film screenings and a whole mixture of guest speakers and conversations to get involved in.